One of the biggest updates in my life is that I have found my own place to call home. While I am grateful for God’s provision, my move has given me the space to reflect on what I have learned from living at a shelter for those experiencing homelessness over the past six months. Through this post, I would like to share what the beautiful community of Skid Row has taught me. I am not the expert and will never be the expert on on those experiencing homelessness: in life we can only fully be experts in what we have personally experienced. Those living at the shelter never pretended to understand what my struggles were. They listened, asked questions, and allowed God to speak. They weren’t concerned with being the ones to solve the problem, but wanted me to meet Christ in every situation I went through.When I started to do the same for those living around me, I truly saw God move. Once I stopped trying to be the expert, and allowed the creator of the universe to be the expert, I got to watch lives transform. 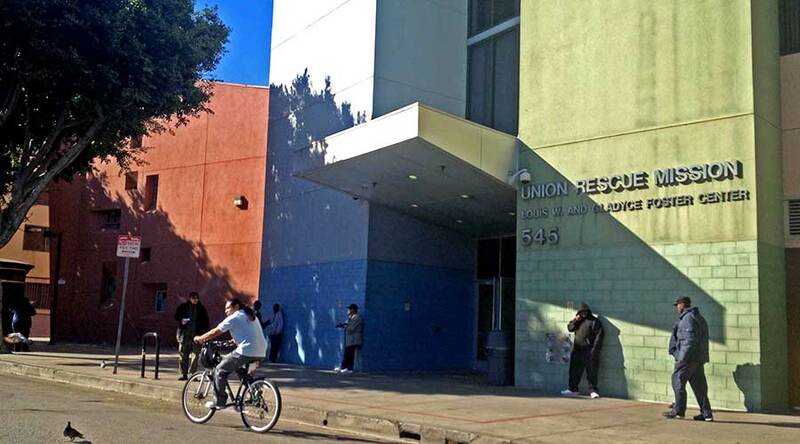 One of the most asked questions I receive while giving tours at the Union Rescue Mission is “what is it going to take to end the epidemic of homelessness in Los Angeles?” At first I was not able to answer this question. But through my time living at the shelter, I think I have started to grasp a direction to begin this process of healing. Now I must start my answer by saying- I am in no way an expert. But through what I have experienced, I predict it is going to take many different types of action. As humans, we are complex beings with many facets. The epidemic of homelessness is a people problem- therefore it is also complex. Foremost, it is going to take the intentional action of us living in the Los Angeles community to be willing to break down the social barriers between those experiencing homelessness and those who are not. There is a very physical line denoting where the Skid Row community and the rest of the Downtown community meet. This barrier creates a very tangible social barrier that I’ve found myself even playing into at times. In full vulnerability, I’ve found myself just assuming that the reason why there are so many people on the streets is because of their addictions or they have chosen not to keep searching for help. I also have found myself skipping a street that I would normally take because someone looks “rougher” that’s resting on the sidewalk. All of these thoughts and actions contribute to the creation of these barriers. Once I started taking steps to intentionally tear down the barriers- through having more international conversations with those I usually would avoid or ask more questions to those I met in the shelter, I started to understand the community. Another lesson I have learned is that I assume way too much. I decide who someone is before they even have a chance to introduce themselves. When I first started living at the shelter, I was choosie. I would only invest time in those that I assumed that I would like. This initial assumption was typically based on physical appearance (physical cleanliness = they have their stuff together) or social status within the shelter. I didn’t realize I was doing this until I started to observe how the men within the program at the Union Rescue Mission would treat each other. While in the program, those that you are in you program are your family. You don’t get to choose who they are, and the only way to understand who they are is to not assume, but rather learn about who they are. These men understand that everyone has messed up, and that in our messiness Christ still loves us unconditionally. Because they truly understand this concept, their first action is to love all of those around them. All different types of men in the program love me so well. Half of them do not even know me on a personal level, but because I was created by the same God that created them they choose to love me. While I am so thankful to have found a place live, I am even more incredibly thankful for the life lessons I learned while living at a shelter for those experiencing homelessness. The biggest lesson I learned was that we are beautifully broken. Yes, we are sinful and fallen, but because we are all created in God’s image we are still beautiful in His eyes.